[Edit] Vastly improved version 0.3 released Aug 31, 2012. Now with more data types and cleaned up error handling. [Edit] Sept 4, 2012. Fixed the linking problem that was causing VIs to be broken on your machines. [Edit] Sept 12, 2012. Full support for variants. More array data types. Problem with serializing time stamps solved so they maintain full precision in JSON. Still haven't tackled the UTF+8 issue for JSON. [Edit] Oct 30, 2012. All data types now included. Test suite refined. INCLUDES CIRCULAR GRAPH OF DATA VALUE REFERENCES (unexpectedly easy solution). [Edit] August 2, 2013. Large number of changes to framework. Expect documentation and changelog to come. Package built for LabVIEW 2013. [Edit] March 4, 2014. Continued refinement of framework. 2D arrays and Filter removed to reduce bloat of the framework (2D arrays still addable as extended types if you want one in your serialization). Binary Serialize/Deserialize added. Split into two packages. Introducing draft version of the AQ Character Lineator, a library for taking LabVIEW objects and reducing them to character sequences and then restoring the objects back later. Why the strange name? Because I got multiple people all having different opinions on what I should call this and I went with a name that has zero hits on Google (a true Googlewhack until someone mirrors this post). These VIs or their evolution may become part of LabVIEW in the future. National Instruments reserves all rights necessary to allow their distribution as part of LabVIEW. Any modifications made may only be shared by posting back to ni.com. You agree that all modified versions posted may become part of LabVIEW in the future without any compensation to you. Package is built for 2013 due to a new vi that the framework takes advantage of. It is possible to save it in previous versions but we lose some speed and efficiency. So... what does this library do? You can create new LabVIEW classes that inherit from Serializable.lvclass, give those classes ONLY TWO FUNCTIONS -- "To Serial Form.vi" and a "From Serial Form.vi" -- and then be able to flatten and unflatten from any supported file format. These two VIs use a could-be-easily-scripted pattern. Autogeneration of these two VIs is a desired feature for the future. In the library, you will find serializers for JSON and Funky XML. The XML is a weird dialect that I made up to test edge cases of file formatting. The JSON is actual UTF-8 encoded JSON. You will find a deserializer for JSON only. 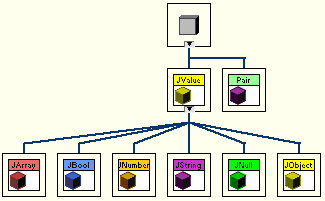 Parsing strings is very hard to do in any programming language because of the extreme attention to detail required. The Lineator helps as it gives you a good framework for knowing when you've covered all the cases that a parser must handle. My goal in creating this library is not to support all the world's file formats but rather to enable others to support file formats as needed. I made the JSON work. Writing a deserializer for any other format is something I hope someone else will take on. I have done a proof of concept for Binary String enough to know that it is possible to support unnamed formats like that. If I write another deserializer, it will be for the binary format. A proper XML serializer and deserializer is a substantial project that I hope someone volunteers for. The Formatter class can provide you with facilities to reformat data for localization. The FXML serializer uses the formatter. The JSON serializer ignores the formatter (JSON defines strict rules for all its data types). You can do load from previous and save to previous mutations in your Serializable's To Serial Form and From Serial Form. Mutations can include renaming the classes. The class paths can be embedded in the string in a few different ways, and there is built-in support for dynamic loading of classes into memory as the string is parsed, provided all the classes that you want to dynamically load are under a common root path. There's pretty much zero documentation. VIs and classes are named with a fair amount of detail, but after that, well, it's a barren landscape. I will be filling this in in the next revision. You're going to see some fairly non-standard error handling on these VIs... I've become opposed to putting "error in" on dynamic dispatch VIs, so I've got a lot more "merge error" nodes than normal whose only purpose is to preserve warnings. I hate warnings propagating on error wires... I'd throw them out of the language if I had my way. The error handling on these diagrams would be a lot cleaner if I stopped trying to preserve warnings. The whole error system may get reworked in a future revision of this library, but it works fully as it stands and I may leave it, depending upon your feedback. Package installs into the vi.lib under the folder NI. Open the enclosed project file. Inside, you'll see a virtual folder for "Test". That is where you will find a partial test plan for the library. Open and run "BIG TEST To String.vi" for a sample of most of the data types in both FXML and JSON and to see how the mutation works across version bumps of your classes. Open any of the "TEST_ME.vi" files to test specific subsets of the type functionality. I am still finishing out the test suite. Any type that does not have a named test suite is not fully tested and is much more likely to have bugs at this time. The ones with named test suites are pretty solid. The Test....lvclass files are examples of the types of classes you would create to be serialized. That's the part 90% of you are interested in. The two inherited functions in those classes are the ones that we want to have a nice scripting tool to generate (the magic scripting tool mentioned in the design document). The JSON Serializer class and the JSON Deserializer class are of interest to the next 9% of you who want to create custom file formats. You can judge for yourselves the amount of labor that will be needed to support a new case. The next 0.9% of you may be interested in localization for human cultures. Take a look at the Formatter class. The remaining 0.1% who actually want to figure out *how* it all works and make comments about the under-the-hood stuff are free to wander where you will. I have added limited comments at this point, but certain sections, like the handling of variants, will require some study to understand. Version 0.3 posted Aug 31, 2012. AQ, I got broken VIs with the new Error Ring. "Error Ring: Library version is incompatible with XNode version"
Yep, I get that error too. Ah... I modified the Error Ring on my local machine... I was playing around with an idea and forgot to put it back. this is the equivalent of the "conpane doesn't match" error for subVI calls. For the moment, just delete the nodes and drop a constant that returns the same error code number. I'll try to put up a relinked version soon. Ok... new version should have the linking issue fixed up. Sorry about that... a hazard of my experiments mixing with each other. I am very interested in the JSON serializer and deserializer. Not while I'm developing. I work in ine version to avoid cross links and to keep my workload down (this is an outside-of-work project). I work in the latest LV version to exercise it and identify issues. When the library is complete early next year (I hope), I'll investigate back porting. No promises. In the meantime, anyone else who wants to do the backport of the interim files is welcome to do so. Any plans to include support for converting a JSON string to XML string? In addition, I managed to write a very cool feature to "LabVIEW-script-create" clusters from a JSON description, however this renderer is working only in the development environment (but could be worth a nice QD plugin ). Basically, JValue knows 2 parser and 2 renderer, so it's possible to read/write JSON text and read/write LV clusters. I never planned it to extend to XML (I would need to create all the datatypes and write the parser/renderer for each) but there's already a toolkit for that . If you're (still) interested in my version, I'd be happy to post it to a proper location in the NI community. Not directly, but if you unserialize the JSON string you can serialize the objects as XML (assuming someone completes the XML serializer). I think I'm past the need for that kind of parsing code at this point. I'll get back to you if I have problems. Once I get the cast off my hand, I'll get back to the project. Latest version is a full complete draft with all data types included, a partial test plan, significantly cleaned up code base and some really nice unexpected features such as DVR circular graph serialization. What's the intended use for the version stuff? FYI, I'm 4 hours into a serializer to an ini format similar to what MGI's Read/Write Anything uses. Finished the serializer, which seems OK, but I need to write the deserializer to test properly. Only minor issues so far, which I could provide privately. The version number allows you to define a version for your protocol so that if you are unserializing information from an earlier version of your set-of-classes, you can mutate it forward. Likewise, you can flatten for previous. Predominantly these become interesting when a server revs but not all clients rev (or vice versa, as is the case with browsers). By "set-of-classes", I mean all the classes that are participating in your particular protocol -- so any class that goes into your communications stream, which may include many unrelated class hierarchies. I've posted it by itself over on LAVA and a few other key users were pinged to make sure it didn't get missed when it outgrew its original goals. If you try to run Big Test From String.vi while TestData.lvclass:From Serial Form.vi has its front panel open, you hang LabVIEW. Verified on a virgin copy of the code. Are we bitten by a LV bug or just missing a timeout? David: Bug verified. I'll see what I can find. Hah... I went away and 15 minutes later, LV unhung itself. Of course, it did so with a "VI Failed To Compile" error that broke the hierarchy, so there is still a bug. I have no idea what the bug actually is, but the problem seems (emphasis "seems") to be springing from the recursion. If you remove the add-on data type classes (Serializable Variant, Serializable Analog Waveform, etc) and edit the test cases to not use them, the problem seems to evaporate. Thank you for reporting this. I've pushed it over to the appropriate developers. Sorry to hear about the bugs. I have successfully deployed this on an RT machine. I think I’m hitting another recursive hang when I try to save TestNestedData.ctl with a new default value. Formatter.lvclass:Timestamp To String.vi produces a data mismatch with the default timestamp value, I think because %20u has too much data. I’m trying to test alternatives to 20 and see if there’s one that’s generally better. Since I couldn’t change the default value, I tried putting a test VI in the formatter class, hit another hang, and cancelled. I couldn’t recover without hitting another hang. Now my formatter class claims that it’s missing a VI, but nothing shows up in the project window as missing. Grr. Argh. BLARGH. Figured out the Timestamp issue. String to Timestamp.vi called String to Extended.vi for the fractional seconds (possibly because that VI had the wrong icon, looking like String to Double.vi. Replacing with String to Double.vi and setting Timestamp to String.vi to use %16u, get reliable matches. (Oops, only reliable right now, other days have issues). Remove the secondary data type formatter classes from the project and from the Poly VI. Then they won't even load into memory. That should eliminate it. I'll keep my eyes open for a better solution. OK, it's timestamp to datetime record conversion that's the culprit. Snippet above easily yields a false except with integer numbers of seconds. Format to string and from string with timestamp codes has the same limitation. I think TestNestedData.lvclass:Compare elements.vi can't work as designed. It's too bad we don't have operator overloading on the Equal? function so that we could just put a tolerance in for timestamps. I've posted my code here AQ Character Lineator INI Serializer/Deserializer. Now I figure out what I learned for an upcoming user group discussion. Oh... yeah... I could've told you that. I discovered that when writing my test cases. Sorry... I focused on the compilation bug and not the comparison issue. You can see the hoops I jumped through in my test cases code for comparing before and after data... I filed the CAR and it got closed as "expected behavior", so I refiled the CAR to have a "does not preserve value" added in blinking red 48pt text to the Context Help window for those primitives. I've been told they'll likely add a sentence but not in blinking, red or 48pt. You should also be aware that there is *no* mechanism in LabVIEW to take a floating point value and generate a decimal string such that you get a decimal with enough precision to guarantee that the original decimal can be reconstructed unless you specify the absurd precisions that I am currently specifying in the code, and even then there are some edge case values for which you just cannot compensate. It would require a custom primitive in LabVIEW to produce the value, distinct from the existing Flatten To String because some bit signatures map to the same decimal values beyond the declared precision of the data types. I've talked to the mathematicians on the LV team and they tell me it is a long standing problem they face reguarly. I am totally unhappy with the handling of floating point values at this time. I filed the CAR and it got closed as "expected behavior", so I refiled the CAR to have a "does not preserve value" added in blinking red 48pt text to the Context Help window for those primitives. I've been told they'll likely add a sentence but not in blinking, red or 48pt. Yeah. But this isn't a case of the CAR being closed because it is too much work or not worth doing. There's no solution for it no matter how many developers you want to throw at the problem. There's no way to encode the original timestamp value precicely as a floating point number of partial seconds. It just mathematically isn't possible ... it will always be lossy. The format of the time record would have to be changed to be an extended precision instead of a double precision, which is a larger breaking change, a hold over from when timestamp itself could only be as precise as a double precision variable. OK - so I am running into the same problem when I build an .exe from the test project using the BIG Test from String.vi as the source. Can someone else take a look and see if they can build an exe from the test VIs supplied by AQ? Maybe this is related to my LV installation (fingers crossed). I don't seem to be having a problem building an .exe from the BIG Test to String.vi. I got error 1502 regarding Deserialize.vi. Sigh. That doesn't bode well. Try the same workaround I offered to David of removing the extended data type classes ... yes, that means removing them from the poly VI, the project and all the points in the test where they're used. Not trivial, but straightforward. I believe there is something about the recursion causing problems. Starting to get somewhere... I think the problem lies in the execution settings. I am now no longer getting the 1502 error on Remove Serializable Array.vi. I changed 'Shared clone reentrant execution' to 'Preallocated...' for this vi and the Remove Serializable.vi. I am now getting a 1502 on Deserialize.vi. I am going to keep digging. Never mind...either it was never fixed or magically back. AQ - can you say something about the the Name Substitutions in the Serializer and Deseralizer classes? I am assuming that they are available so that you can retarget the location? So, as it stands, the deserialization is not compatible with RT. Thus far, Deserializer::Get Class Default Value By Name uses a property node that is not compatible with RT (ProjectItem->Path). And, I am not really understanding what the code is doing. In Deserializer::Load Top-Level Dynamic Paths, it appears that the deserializer is getting the default values based on the paths available through the ClassPaths identifier (and Deserializer::Load this Level Dynamic Path appears to do the same for the "One path with each object" formatter specification). But, then this vi does nothing with the default values. Am I missing something? I've tried a real world example in a large project (~5600 files). It chokes on 46 calls to Deserializer.lvclass:Get Class Default Value by Name.vi which average about 0.7s each, for a grand total of over 32s. I'd want it to run 50x faster to give reasonable performance. In BIG TEST From String.vi there are 24 calls averaging 0.15s, and again it's the dominant time by a wide margin. Any hope for an optimization? > Any hope for an optimization? This is a first draft wherein I was trying to get the functionality right. I haven't done any work on performance yet, other than keeping in mind throughout the development trying to make the system not create data copies of the elements during serialization. I have not actually confirmed that I was completely successful with that, nor have I done any profiling. Can you do profiling without using any particular file format? That would give us a good clue about whether this is something about the particulars of the JSON parsing that I coded (which I will happily admit is totally outside my skill set) or in the serialization framework proper. And I forgot to mention... Deserializer.lvclass:Get Class Default Value by Name.vi will be a lot faster in LV 2013. I had to ammend the underpinnings of LV to accelerate that function, so I can't backport it to LV 2012 or earlier. I think that 24 and 46 were reasonable numbers of calls to Get Class Default Value by Name in each case, so cutting down the time for each call, which you are on top of, is the essential thing.